Access to health care services can mean the difference between life and death. That’s something Dalton Burgess can attest to. He credits the Rapid Access Addiction Clinic (RAAC) at St. Paul’s Hospital with saving his life. Before getting treated there, Burgess struggled with extreme opioid abuse for years. During a period of abstinence, he earned a business degree, built a career, got married, had a son, and bought a house. But the cycle of addiction, relapse and recovery continued. Tragically, his wife Emily died of a fentanyl overdose in 2016. “Although Emily had not used any drugs since she was a teenager, I think she wanted solace from the pain of watching me tear our lives apart,” Burgess said. He spent the next year trying to numb the pain of that loss. He used drugs again and was living on the Downtown Eastside. Then someone told him about the RAAC, a low-barrier out-patient clinic at St. Paul’s. That’s where Burgess found the help he needed. Today, Burgess is a Peer Navigator at the RAAC where he helps others facing substance use challenges. He shared his powerful story on Tuesday at the official unveiling of a groundbreaking new care model at St. Paul’s designed to support people with mental health and substance use issues. 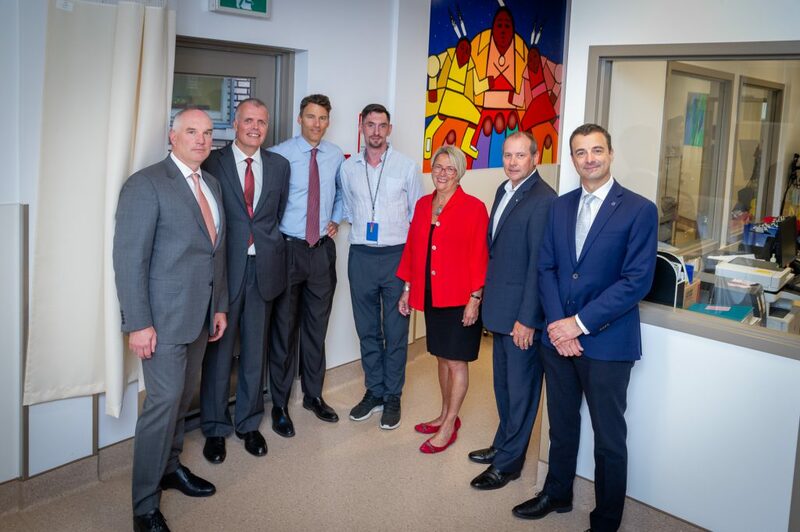 Tuesday’s event marked the launch of the new Emergency Department HUB and Vancouver Police Foundation Transitional Care Centre (VPF TCC), which join the recently-opened RAAC and the Overdose Prevention Site (OPS) at St. Paul’s. These four components create a one-stop-shop for integrated and specialized mental health and substance use care designed to meet people’s individual needs. Judy Darcy, Minister of Mental Health and Addictions, praised the set of wraparound services provided to connect people to the supports and services they need. 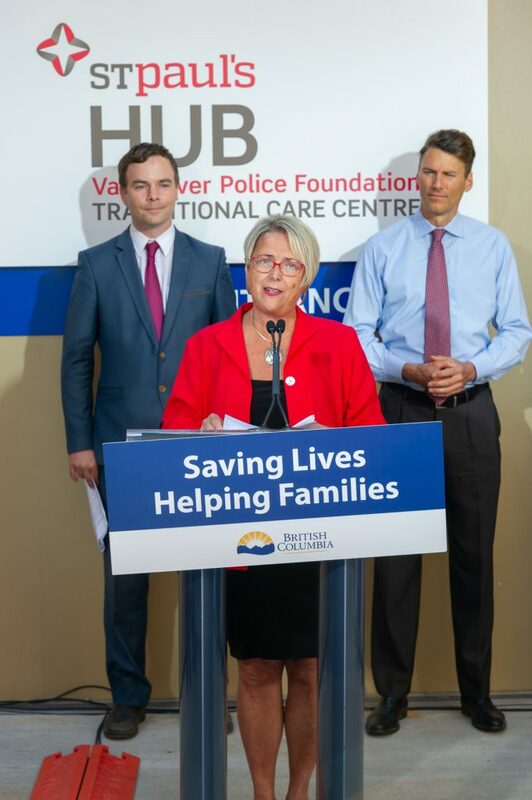 In making the formal announcement, Judy Darcy, Minister of Mental Health and Addictions, praised the set of wraparound services provided in one judgment-free location that connect people to the supports and services they need. The HUB ED has up to 10 beds dedicated to rapid assessment, treatment and stabilization of mental health and/or substance-use-related disorders. Patients can then be connected to the RAAC, or to the VPF TCC, a safe, short-stay facility that links people to supports and resources before they return to the community. Just outside of St. Paul’s is the OPS, which, in partnership with RainCity Housing, provides access to trained staff and peer support workers who assist people with safe substance use. 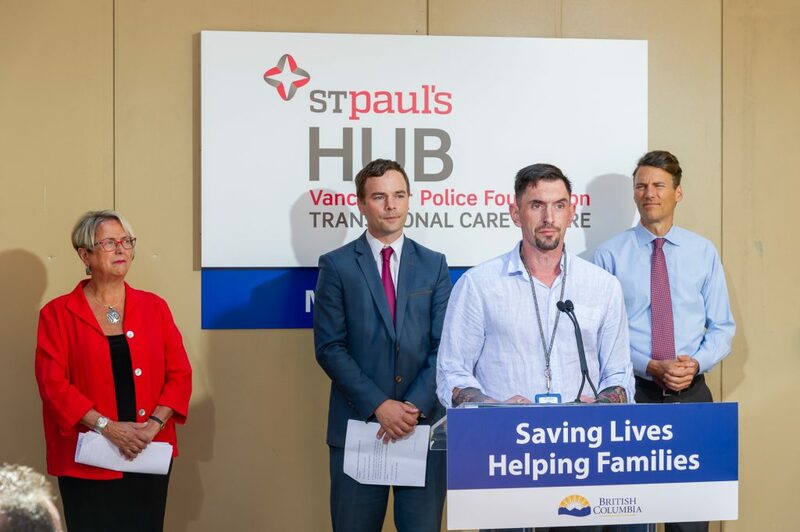 This transformative care model is well-suited to St. Paul’s, whose ED treats the greatest number of patients with mental health and substance use challenges in B.C. There are nearly 11,000 mental health and substance-use-related Emergency Department (ED) visits each year. When his team first learned about the idea of the HUB, St. Paul’s ED head Dr. Dan Kalla said it represented “a potential lifeline.” At the time, the ED was facing an unprecedented rise in mental health and substance-use-related visits. Things were intense. Today, the HUB model is already making a difference. “The extra HUB beds are already easing the flow of our ED. It creates more capacity throughout the whole hospital and provides a buffer we didn’t have before. One that is essential in times of surge,” Dr. Kalla said. At the same time, he said, it helps to meet patients in familiar surroundings and provides them with compassionate, culturally appropriate care. Ensuring that Indigenous people receive culturally appropriate and culturally safe care is a key piece of this care model. This is achieved through the integration of the Indigenous health team and connections to Aboriginal healing programs. In addition, Indigenous artist Jerry Whitehead’s artwork adorns several of the new facilities, creating a warm and welcoming environment for all. It’s been four months since Dalton Burgess joined the RAAC as a Peer Navigator and he’s happy to be giving back to the clinic that changed his life for the better. “I’ve fallen to the deepest depths and touched the highest peaks. And now I’m grateful to the RAAC and to all St. Paul’s services for getting me to where I can give back,” said Burgess, who now helps people who are in the same position as he once was.